Pithophora is a common filamentous algae, that forms large mats on the surface of the pond. 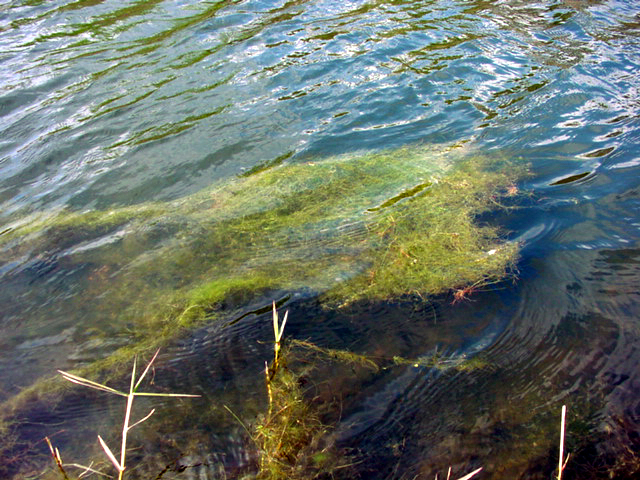 Filamentous algae, or commonly referred to as "pond scum" or "pond moss" forms greenish mats upon the water’s surface. 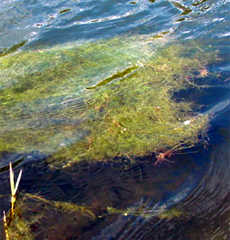 The stringy, fast-growing algae can cover a pond with slimy, lime-green clumps or mats in a short period of time. This algae usually begins its growth along the edges or bottom of the pond and "mushrooms" to the surface. Individual filaments are a series of cells joined end to end which give the thread-like appearance. They also form fur-like growths on bottom logs, rocks and even on the backs of turtles. Some forms of filamentous algae are commonly referred to as "frog spittle" or "water net". * Pithophora- often referred to as "horse hair" algae because its coarse texture resembles that of horse hair and it may feel like steel wool. Spirogyra is a free-floating genus of filamentous algae belonging to the division Chlorophyta. It is a photosynthetic algae with impressive long bright grass-green filaments with spiral-shaped chloroplasts. It is sometimes known as "green silky-strand algae". It is bright green in the spring but deteriorates to yellow. Spirogyra grows in running streams of cool freshwater, and secretes a coating of mucous that makes it feel slippery. This freshwater algae found in shallow ponds, ditches and amongst vegetation at the edges of large lakes. Under favorable conditions, Spirogyra forms dense mats that float on or just beneath the surface of the water. Blooms cause a grassy odor and clog filters especially at water treatment facilities. Masses of it are very slippery. It is most abundant in the spring. Pithophora belongs to the family of filamentous green algae. Pithophora is a common mat-forming species, commonly referred to as "horsehair algae", that inhabits ponds, and is especially troublesome in Florida. It clogs waterways and lakes with its large mats and filaments. Pithophora may range in color from lime green to a dark green or greenish brown. It is often described as resembling a tangled mass of steel-wool or wool-like growth which is very course to the touch. Individual filaments show extensive branching. It may be found growing on the bottom in a mat or in a column, with large sections reaching for the surface of the water forming dense mats on the surface. Its growth is quite prolific. These algae possess the ability to fix and store nitrogen for growth, and out compete other vegetation. Pithophora grows on the bottom, attached to the substratum by holdfasts, and sporadically surfaces. When it becomes dense enough, the plant produces gas bubbles that become trapped. In warmer water, it becomes buoyant and it floats to the surface. Disturbance of these mats by high wind or heavy rain events may cause them to temporarily sink to the bottom. This often gives a false impression that the growth has “disappeared", only to have it return to the surface within several days. Copyright ©2002-2014 Bioremediate.com LLC. All Rights Reserved.